June 15th 2012 is the International Network for Protection of Elder Abuse’s (INPEA) 7th Annual World Elder Abuse Awareness Day. With different events to raise awareness in countries around the work, Littman Krooks LLP, has put together useful information to share with your loved ones to help spread awareness and end elder abuse. Last year, a study from MetLife was released regarding the increase of exploitation of seniors. Through analyzing news articles that referenced financial abuse of the elderly and extrapolating data from findings, results showed that a majority of the cases involved strangers and “scams,” whereas friends and family were also found guilty of exploiting their loved ones but usually through forged checks, stolen credit cards, drained bank accounts and transferred assets. – Women (between the ages of 80 and 89) who live alone and require some type of outward assistance are the most targeted victims of financial abuse in the United States. – Approximately 51% of all instances of financial abuse of the elderly are crimes committed by strangers, and 34% come from family, friends or acquaintances. – Men (between the ages of 30 and 59) accounted for 60% of crimes against the elderly. – Telemarketing scams – calling potential victims and using deception, scare tactics, or exaggerated claims to get them to send money. Perpetrators also make charges against victims’ credit cards without authorization? – The elder is unaware of or does not understand financial arrangements that have been made for him or her. Want More? Click here to listen to hear a special podcast on “Financial Scams Against the Elderly and other Financial Abuse” from “Peace of Mind with Bernie the Attorney” featuring guests from the PACE Women’s Justice Center, Joan Blackburn and Susan Ferlauto. To visit our iTunes library for more podcasts, click here. 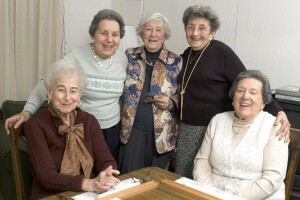 For more information on elder abuse, visit the National Center on Aging (www.ncea.aoa.gov).For other questions regarding elder law or seniors, please visit www.elderlawnewyork.com.